I recently joined – I should say that Jake recently joined – a Little League team. 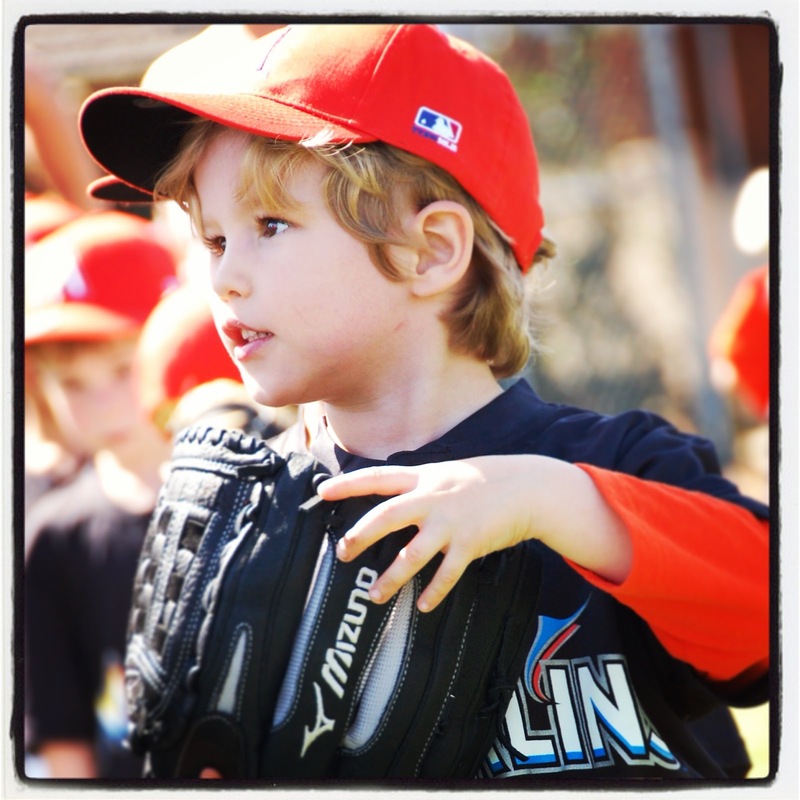 (Go MARLINS!) Now, this is not the first kiddie sport that I’ve signed him up for. Swimming was fun and frankly a little scary when he was 18 months old. L.A. Sports Kids was adorable because the kids were so little, and everyone got a medal. So Little League seemed like the next natural step. I love baseball and adored the Reggie Bar, so this would be perfect. Who doesn’t love cute little kids running around the bases and picking flowers when they should be watching for a pop fly? Well, come to find out that Little League is a heck of a lot of work. I did not know what I was getting myself in for. When you’re the coach’s wife, AKA the equipment coach, snack center, pack mule and fundraising maniac, it gets to be a bit much. No one tells you exactly how much time you have to invest during the week to watch your kids pick flowers… I mean, catch a pop fly – kind of. No one tells you that it means the end of sleeping in on a Saturday morning or lazy Sundays spent in the back yard. And no one tells you that it means hauling a cranky kid out of bed, getting him on the field and watching him have a meltdown in the middle of a game. He wants to quit. Sometimes you want to quit. I hate to admit that in the first month of Little League, I found myself cranky: complaining about the time investment, the amount of equipment I had to cart around, the politics of the Little League staff and dealing with the parents that didn’t seem as committed as I was, or were perhaps not carrying as much of the weight as I felt I was with the team. And then one day, something magic happens. Your kid swings at the ball, connects, and it flies more than 10 feet from the tee. And something inside both you clicks. The sun shines bright, you hear the laughter in the air and 12 rookies start to become a team. I cannot describe the feeling, but many of you know exactly what I feel. Little League has taught me a few lessons these past 5 weeks, and I’m sure I will learn a few more. Here’s what I’ve learned so far. 1. Nobody starts at the top. No matter how smart your child is or how good they were at soccer, baseball is a whole new ball game. There are rules to be learned; etiquette to follow. And no matter how well you plan your drills, no drill reaches everyone. Each child learns in their own way. What works for one child might not work for yours. And each child has certain unique talents that you need to find to strengthen the team. And so you run new drills. Practice new skills. You practice again, and you do your best. You get back at it until you find what works. 2. Getting better takes time. Greatness doesn’t happen overnight. Before Little League, my son connected every time he swung at the ball. I was sure he would be a slugger. Now, with a real bat, there is an awkwardness in his swing that I’m trying to understand. He wants it to happen now. Heck, I want it to happen now. But we will only find the answer with time and a lot of hard work. Both he and I have to have the patience to be in it for the long haul – keeping that long term goal in sight, and taking small steps each day to get there. 3. Everyone on the team plays a part. So, there is always a kid on any team that is a natural. On the Marlins, that’s Brandon. At five, that kid can clock the ball out of the park – as far as “out of the park” is for a 5 year old. And that’s great. But Brandon can’t win the game for us if our defense is weak, if the shortstop misses a grounder or the first baseman is too busy looking at dandelions to catch a ball. The team has to work together towards a common goal. Sure, someone will always pull a little more weight than the others. That’s just the way life works. But everyone needs to be performing at a solid level for the team to get a win. 4. The folks on the sidelines matter – a lot. As the Marlin parents, first we were grumpy. Now, we live and breathe Little League. And it’s not just the coaches. It’s all of us. We all got jerseys and caps. We all scream our guts out for each and every kid – whether they are on our team or on the opposition. (They are 5, after all.) Kids gets discouraged when something is tough. They want someone to swoop in and save them. But they need to learn to do things on their own and be accountable. And with us on the sidelines, they do it in a safe place where they have help to turn to when, or if, they need it. They have people who will lift them up when they do miss the ball and need a little encouragement. 5. Stick with it, and you will have a moment of sheer beauty. Jake has been struggling, but he had a moment of brilliance last weekend. After a rough run on first base, he moved to the pitching mound, and a big kid slammed a ball right at his head. Jake glanced up just in time, caught it perfectly, turned and lobbed it straight into Brandon’s mitt on first base. It was a thing of beauty. It happened in a moment, and that moment was earth shattering. I cried. And then, he did it again. One achievement led to another and another. And suddenly, that batting got a little bit better. Now this is a work and a marketing piece. What does this all mean for you and your business when you are out in your offices, mentoring a new employee or lifting up a coworker who is having a rough time? What does it mean for your team? I’ll leave that up to you. For the record, I am still cranky with losing all of my “private time,” and I can’t wait for another Saturday under the sun, sitting on the grass and watching my radiant child in the sunlight. Tags: Business, Growth, Learning, Little League, something magic, Team, Teamwork | Permalink.